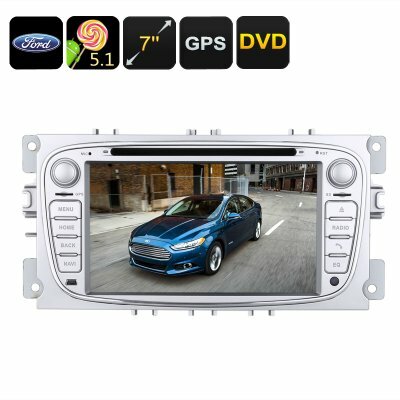 Successfully Added 2 DIN Car DVD Player - Ford Mondeo (2007 to 2011 Models), Android 5.1, GPS, 7 Inch Screen, CAN Bus, Region Free DVD to your Shopping Cart. 2 DIN car DVD Player with CAN BUS puts you in total control without taking your hands off the wheel. Android GPS navigation will be your copilot ensuring you're never lost on the roads again. Prepare yourself for an awesome entertainment experience with this 2 Din Car Stereo. Made to fit Ford Mondeo (2007 to 2011 models) this double din car stereo is the best way to enjoy Android in your car. Its large 7-inch touch screen has HD resolutions and you'll be able to interact with this Android car stereo in the same way you do your smartphone, by simply tapping the screen. Coming Can-Bus technology ensure compatibility with your Ford Mondeo so you can also you interact from the steering wheel making it easy to adjust volume, change tracks and much more without taking your hands off the wheel. Running on the easy to use Android lollipop OS and with the Google Play store, you'll have access to a wealth of apps as well as plenty of music and media programs to download so you can enjoy the latest tunes and films for the best in car entertainment. The car stereo lets you enjoy full connectivity with your phone through Bluetooth so you'll be able to share music and answer calls hand free when the two are paired together. Support for 3G dongles brings data connectivity on the go so you can easily surf the web or get the latest news updates, alerts and notifications. The region free DVD player supports all common disc and media formats so no matter where you got your movies or music it will play smoothly on this Mondeo media player. The benefits of GPS support can't be understated and with Android maps, you can easily pinpoint your exact location, even when traveling at speed. This sensitive GPS antenna makes finding your way easy and with voice function, this GPS navigation system will direct you through every turn to your location. So you can sit back and enjoy the ride without having to stress over reading maps or negotiating complex road layouts. This 2 DIN Mondeo Car DVD Player and navigation unit comes with 12 months warranty, brought to you by the leader in electronic devices as well as wholesale in car entertainment systems and GPS devices..
Micro SD card Slot, GPS Maps.